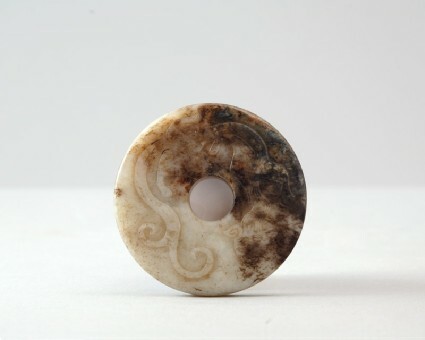 The disc may have been inspired by archaic jade discs, but does not appear to be made of jade. The design is not archaic, nor is the shape, with its rounded edge. The circular disk is made from variegated white and grey stone, cut from a flat plaque, with a small circular hole in the centre and a rounded rim. One side is plain, the other side carved with a curling dragon in low relief, with a long mane, pointed ears and split tail.